Each learning platform has its own address (example: company.training-online.eu) therefore you have to know it. Most probably you will find the account creation email or some course enrollment emails where you may find the link. Username was sent to you in the account creation email. Try to search your email account. You may also use your email address as the username. You either use the link that was sent to you in the account creation email and set your password, then you are logged in automatically. Or you just use the password you set before. In cases you didn't find any login email, there is an option to recover your password via the I don't know my password function. After you login you see the My Study page, in some cases there is your personel information update required. In cases the Update account apperas and you are not ready to fill in, you may navigate away by using the main banner menu. 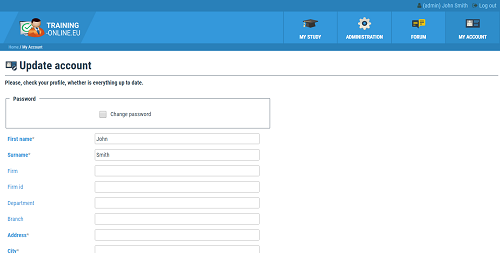 The update form will appear every time you login unless you fill and save the required details. Edited 4 time(s). Last edit at 11/07/2017 08:47PM by Masteradmin.